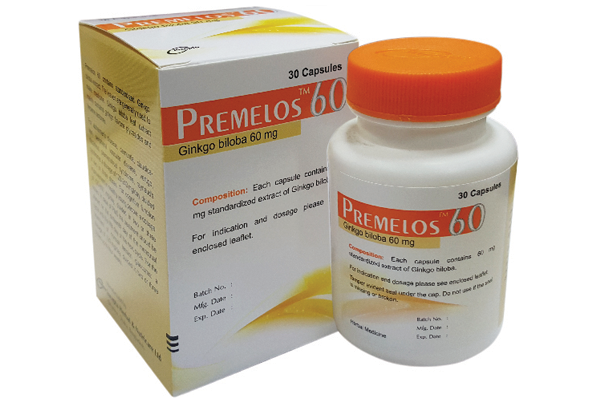 Premelos 60: Each capsule contains 60 mg standardized extract of Ginkgo biloba. 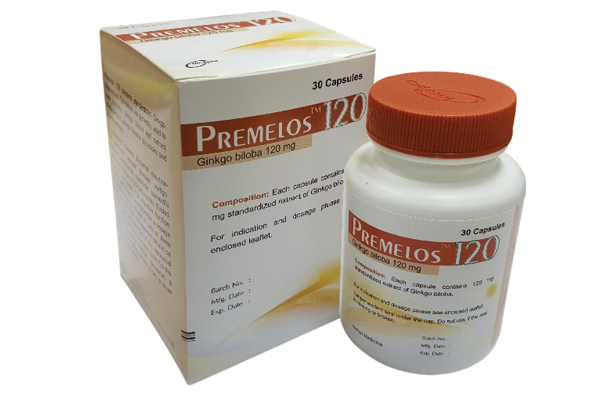 Premelos 120 : Each capsule contains 120 mg standardized extract of Ginkgo biloba. Ginkgo biloba is one of the most widely used and studied herbal products around the world. The leaves are generally used to make medicine. Ginkgo biloba leaf extract mainly contains Ginkgo flavone glycosides and terpene lactones. Most Ginkgo supplements are standardized to 24% of the Ginkgo flavone glycosides and 6% of the terpene lactones. The Ginkgo leaf extract protects the neurons from oxidative damage potentially preventing the progression of tissue degeneration in patients with dementia. Additionally, Ginkgo biloba leaf extract improves blood flow throughout the body, and it restores the balance between prostacyclin and thromboxane A2 resulting in improved vasoregulation. Vascular contraction and improvement in the venous tone are thought to be the result of phosphodiesterase inhibition and release of catecholamines. Alzheimer's disease, dementia etc), thinking problems caused by old age, thinking problem in young people and color vision in people with diabetes, vision loss in glaucoma patients, intermittent claudication. "Before taking this product, tell your doctor if you are allergic to it, have bleeding problems, seizures, convulsions or epilepsy. Ginkgo biloba may decrease the ability of blood to clot. Stop taking this product at least 2 weeks before surgery."